Racine, Wisconsin (11/14/2017) – When Humminbird® introduced the SOLIX™ Series in January, it redefined sonar by integrating its most revolutionary technological features into a new line of powerful, easy-to-use fish finders. 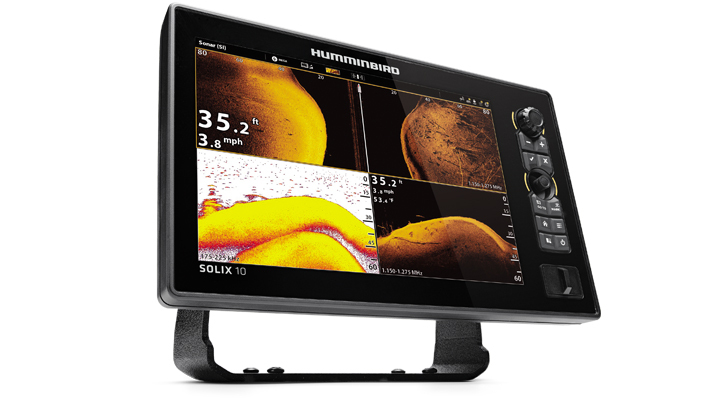 For 2018 Humminbird has expanded the series with the SOLIX 10. Its 10.1-inch screen makes it ideal for use at the bow or on more compact console settings. The SOLIX 10 helps anglers find and catch more fish with the most advanced sonar, image clarity and mapping capabilities in its class. The SOLIX 10 comes in two models: one featuring Humminbird’s exclusive MEGA Imaging™ with GPS and CHIRP Digital Sonar, and another with GPS and CHIRP Digital Sonar only. Humminbird’s ultra-clear MEGA Imaging™ is the first Down and Side Imaging technology to enter the megahertz range with performance that’s nearly three times greater than traditional 455 kHz frequencies. It results in the clearest, sharpest on-screen images ever seen. Anglers can choose MEGA Side Imaging for an incredible view to the left and right of their boat, while MEGA Down Imaging gives crystal clear pictures of what is beneath the boat. Both carry a range that covers the most popular fishing depths. MEGA Imaging works in conjunction with CHIRP Digital Sonar, which fires more pulses than traditional transducers – and more pulses mean more information, improved target separation and superior image clarity at greater depths. The SOLIX 10 comes standard with Humminbird’s Cross Touch® Interface, which allows anglers to operate the fish finder via touchscreen or with the touchpad. Users can customize the screen with up to four independent viewing panes to simultaneously get the Down Imaging, Side Imaging and GPS mapping information they need – at a glance. Individual panes can be zoomed in/out, or moved to different screen locations based on an angler’s preference or the fishing situation. Standard on the SOLIX 10 is the new Humminbird Basemap, which helps anglers pinpoint fishing hot spots by showing freshwater depth contours in 10- and 20-foot increments for more than 10,000 American lakes, and precise coverage of the entire U.S. coastline thanks to NOAA-based charts, the most trusted source of coastal data. The Basemap also includes navigational aids, marker buoys, depths, points of interest and launch locations to improve the boating experience. In addition to the pre-loaded lakes with contour mapping, the Humminbird Basemap provides shoreline-only maps to hundreds of thousands of other lakes. It also displays highways, roads, railroads, bike paths, and streams, along with more than 200 icons. Another standard SOLIX 10 feature is AUTOCHART® Live. This exclusive Humminbird technology maps and saves depth contours, bottom hardness and vegetation data on any body of water. Fish relate to depths, weed lines and transition points in bottom type – for example where a soft, muddy bottom transitions to firm sand or rock. By collecting all that data on an AUTOCHART Live map, Humminbird helps anglers find the “spot on the spot” like never before. AUTOCHART Live is also compatible with i-Pilot® Link™ from Minn Kota® for the utmost in boat control and fishing success. With the fish finder and trolling motor communicating, an angler can tell his Minn Kota trolling motor to “follow” a specific AUTCHART Live contour at a set speed, and with the press of a button the boat will automatically follow the exact path. Without touching the trolling motor controls, anglers can stay on a weedline, depth or bottom hardness contour to keep their bait in active water at all times. The new units are also fully compatible with Humminbird LakeMaster® charts, SmartStrike™ and Navionics® Gold/HotMaps™. Bluetooth is built into every SOLIX 10, allowing anglers to sync their smartphones to the fish finder and view text messages, missed calls and signal strength right on the SOLIX display. It creates a flawless on-board network of electronics and connectivity. For plug-and-fish networking, high-speed ethernet provides easy connections to Humminbird 360 Imaging, Minn Kota i-Pilot Link, Humminbird CHIRP Radar, and additional SOLIX or select HELIX units. Anglers can mount the SOLIX 10 on the boat dash or at the bow on the included gimbal, or directly to an optional RAM Mount for multi-directional viewing if desired. For more information call Humminbird at 800-633-1468 or visit Humminbird.com/SOLIX. While it looks like it’s a very nice unit, It is not for most anglers. The price point for these units is just too high.